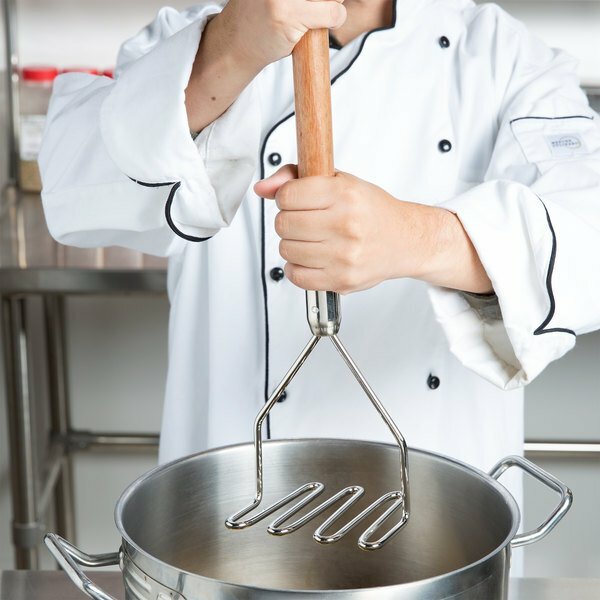 Increase efficiency in your commercial kitchen while reducing employee fatigue with this 18" potato masher! 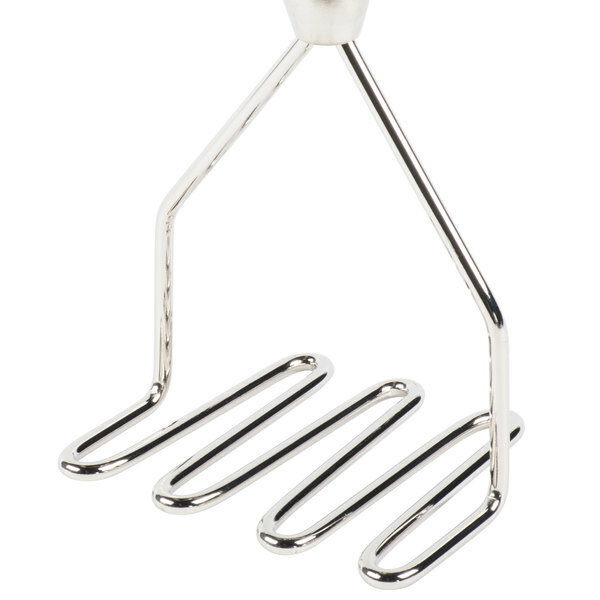 With an easy-to-clean chrome-plated surface and a soft grip handle, this potato masher is guaranteed to help your staff make fast work of crushing cooked food, no matter how large the task. 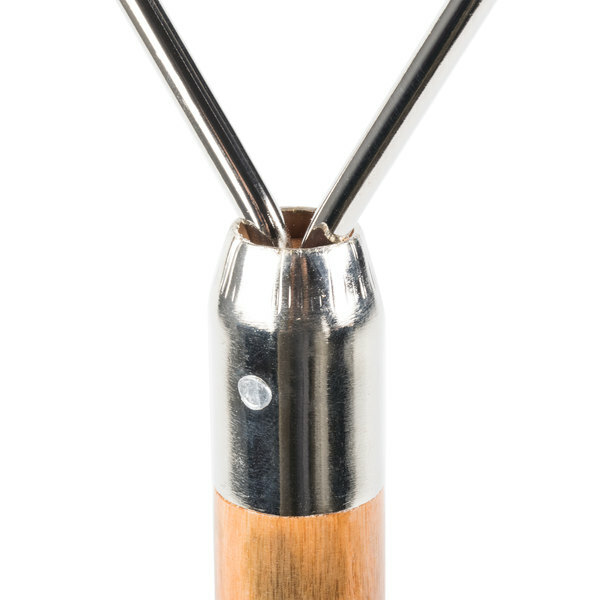 This potato masher's extended handle makes it perfect for use with deep pots. 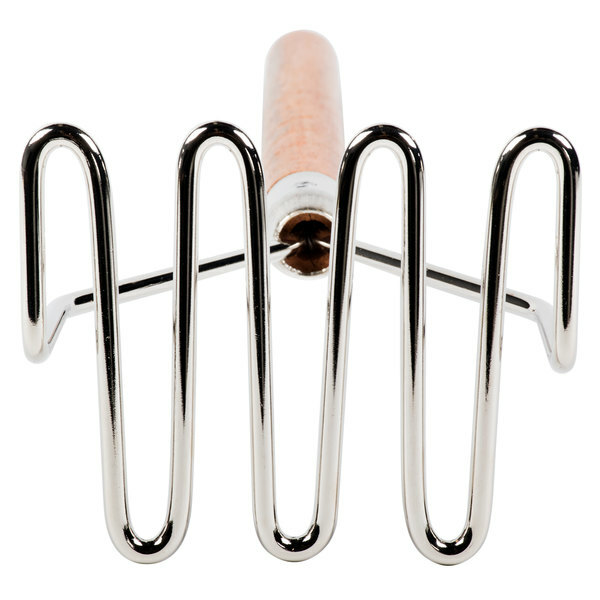 At the same time, the square face ensures that this potato masher will reach every corner of your pot. This large, 4 1/2" x 4 1/2" square face is easy to maneuver, yet is large enough to quickly crush large batches of foodstuff. Simply grab the handle of the masher and push the mashing plate down onto the food - it's that easy! 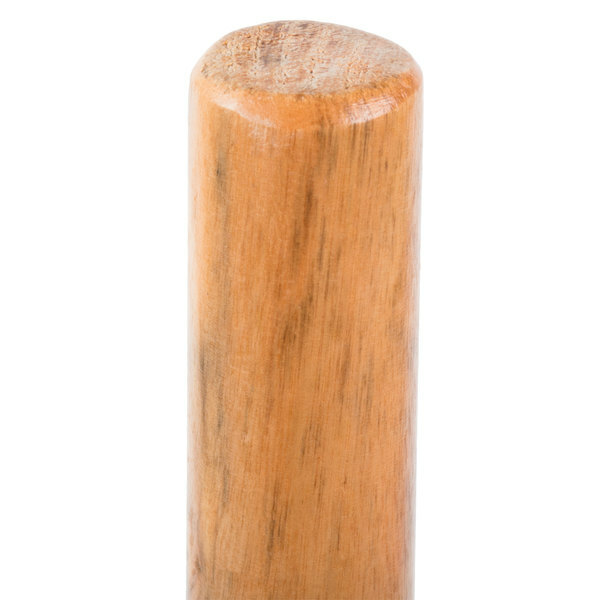 While this item is ideal for mashing potatoes, it is also a great tool for mashing up sweet potatoes and other root vegetables for whatever unique dish you are cooking for dinner. 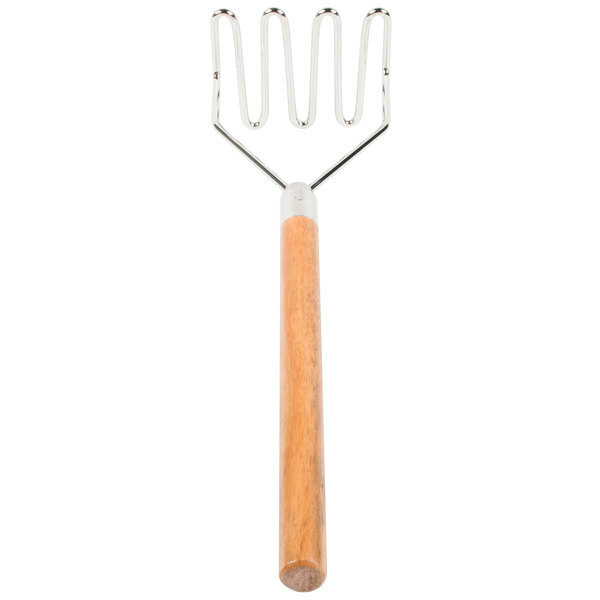 Great Masher, at an even better price, we've bought many mashers over the years, usually paying 3x more, glad i found these, they last long and are priced right. Thia is the cheapest of all the ones offered, and still lasting a long time, great deal. This is a no joke potato masher. If you have a lot of potatoes to mash all at once this is the tool you need. Great for large pots as the handle is pretty long. If you make mashed potatoes from scratch, this tool is a must have. This tool is giant! It is well made and very sturdy. I expect we will have this for a long time! This is really thick and bulky which is good if you are doing huge pots of potatoes. We use it for grits and its great, but I'm sure it won't last too long. The handle looks a little flimsy. Overall decent for the money. Good buy. Only way this could be better would be if it was all stainless steel. Shipped fast and we had it in no time. This is huge! 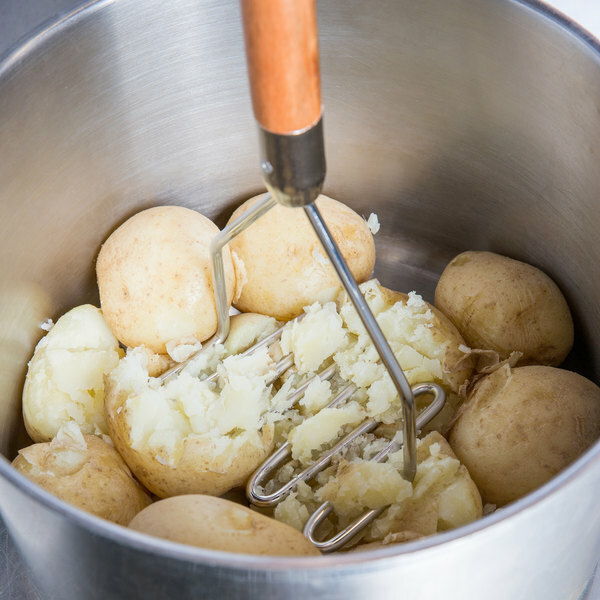 It is so much fun to use and mash large amounts of potatoes or veggies quickly. The only thing is the areas between the masher are quite large so if you don't want lumps it can take awhile. But works for potatoes or cauliflower if you are making a healthy mashed potato substitute! This stainless steel potato masher works very well. I have used it on al dente potatos with ease. I would highly recommend this sturdy masher. This potato masher is huge, I didn't think it would be as big as it was, its definitely made well and made to last. It has a nice smooth wooden handle and is great for big kitchen pots. The metal gauge on it is thick and strong. I would recommend this product to anyone looking for a good quality masher. Alright, I read the reviews before buying and noticed some mentions of its overall size...and they are accurate. If you are just looking for a masher for the house, this thing may be a bit to big for you. This guy is a juggernaut of potato mashing. The handle length plays a large role in this assessment, but the head is also quite large. Overall quality looks great with no complaints so far after going through about 10 lbs. worth of spuds. Great, large potato masher. We make about 150 pounds of mashed potatoes a day, and this masher allows for great texture with all the little lumps. We use these to mash avocados because this brand is the sturdiest we can find. I still wish it was more durable. They only seem to last 6 months or so before we they snap where the metal meets the wood. 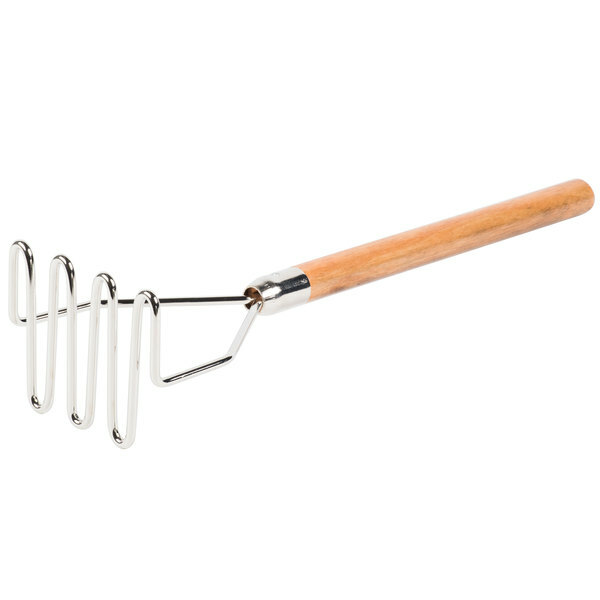 This potato masher is great! It's a little bigger than we expected, which is a good thing. The handle is long and sturdy, and it's easy to clean. This potato masher works great. It's sturdy and good quality. The wooden handle doesn't break and still feel smooth after multiple washes. It's a good buy. This masher is super high quality and very heavy duty which is great. It is just a bit too big to use in a residential home, but for a commercial kitchen, it's perfect! A good potato masher. We'll have to see how the wooden handle will wear off with time, but so far it's comfortable, and a useful tool mashing any vegetables. When my wife first saw this thing she thought I was crazy... until she used it. Yes it looks like a beast but man does it make quick work of a big pot of potatoes. I've even used it making saurkraut, putting a lot of weight on the thing to smash the cabbage. Get this, you won't be disappointed, I promise! This is a good quality potato masher, but keep in mind the size. The picture does not really do it justice, it really is pretty huge and more designed for restaurant use or making huge batches. I will try to post a picture of the masher in relation to another item to get a better feel for the size. The masher is well built and works very well. However after the first use the masher started to discolor. After using other mashers for a longer period of time we never have seen anything like it. Typically the mashers stay almost the same way they came but not this one. Thank you for your review, Larry. We are sorry the finish on your potato masher discolored, leaving you with a defective product. A Customer Solutions Representative will contact you shortly to make sure you are credited. This thing is a beast, and a bargain. It'll make short work of quite a large bowl of potatoes with no fuss whatsoever. The only drawbacks come from its size - definitely make sure you've got somewhere to put it! The handle is also pretty much unfinished wood, so you might want to prevent splinters by sticking some heat-shrink tubing around it. This is definitely larger than your standard kitchen potato masher, but the long handle makes it easy to maneuver. It makes quick work of a large pot of potatoes. I bought these for guests rooms without realising how big they were, completely my error. I did not get a chance to use them, but when taken out of the box, they were lightweight but felt sturdy. This is the second potato masher we bought, this design seems to work better than the round. Probably a little over priced, but it gets the job done. We use our potato masher for many different kitchen tasks. It acts as a great spoon for our meat sauce as it is easy to break up bigger chunks of meat. 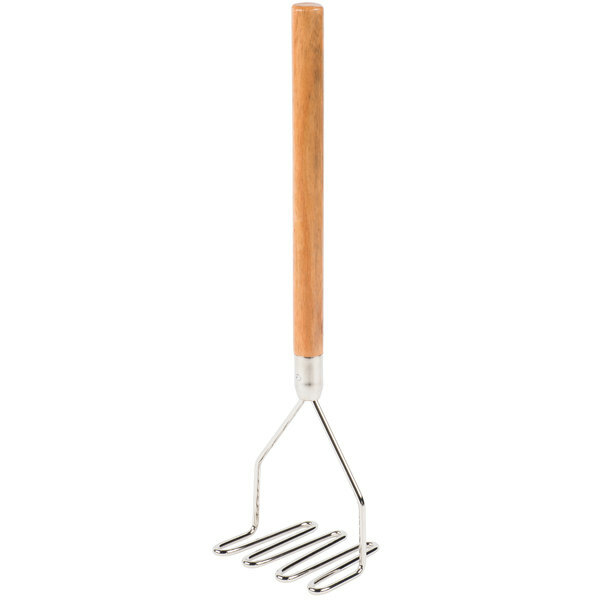 This 18" square face potatoe masher is a must when making a large batch of potatoe salad. Very good quality. very sturdy and a good buy. Ahh, at last, the perfect potato masher. Not only does it do well with russet potatoes but sweet potatoes as well. The height is perfect and it cleans well. I recommend this buy. 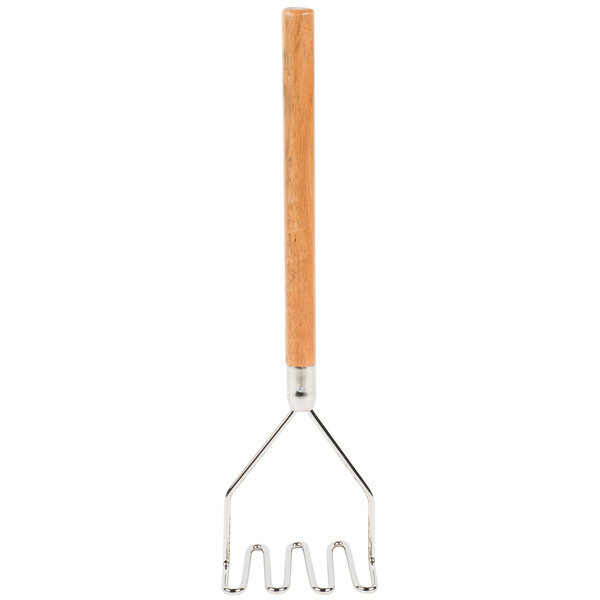 I really like This 18" square face potatoe masher. It is made well and really holds up. I use it when making potatoe salad. I like my potatoe mashed a little. This masher works great. It makes mashed potatoes so smooth and it is very durable. I have gone through 3 potato mashers in the past 2 months, and this one is just perfect. Guess who volunteered to mash the potatoes this Thanksgiving? My baby sister did, and all because she wanted to use this monster masher! I am so glad I got this. It's so sturdy and mashes a stockpot full of taters in seconds. Every home should have one of these and not that useless black plastic one. I also love the way it looks in my utensil crock - looks like I'm very serious about my mashed potatoes. I was at a wedding last week and I used the potato masher to make garlic smashed potato. The masher looks great, works well and is easy to clean. Awsome Potato Masher. Hi quality product. This masher will last for years. Long handle to get you to the bottom of any pot. Thank you for a great product.